The cable allows you to share an Internet connection among multiple devices without the need of separate Ethernet cable. Meet HDMI 2.0 standards (4K Video at 60 Hz, 2160p, 48 bit/px color depth) that supports bandwidth up to 18Gbps and backwards compatible with earlier versions. The HDMI A-to-A/Male-to-Male Cable support Ethernet, 3D, 4K Video and Audio Return Channel (ARC). It is suitable for HDTV, LCD, Plasma/3D/LED/Apple TV, Home Theaters/Cinema, Sky/Virgin HD, Freesat, Dream Box, Set top Box, PS3/PS4, Xbox 360, Nintendo Wii U, HD DVD player, Blu Ray, Projector, Digital cameras and camcorders, Laptop, PC, Tivo, Vizio, Sony and more. Backed by Amazon 30-day money back policy, 6 months replacement and 12 months compensation warranty. Honstek HD04 HDMI cable has pearl chromium plating coating with perfect performances on flatness, brightness and hardness and uniform thickness, which presents sci-fi and fashionable appearance. The cable adopts gold-plated interface, which can increase the conductivity of the plug to the furthest on the base of preventing oxidation, as well as ensure stable transmission of signals. Composed by oxygen-free copper cable core, the conductor provides higher transmission speed guarantees clear pictures and has high oxidation and corrosion resistance. 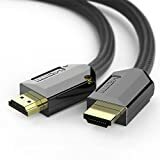 It helps you a expand your view from small mobile, home entertainment system or gaming device to a large HD TV or projector, playback just got more impressive. Deliver clear, vibrant video, offer dynamic synchronization of video and audio stream: it can deliver two video streams (dual view) simultaneously and up to four audio streams simultaneously.